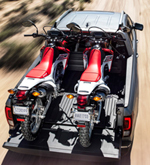 What's New for the 2019 Honda Ridgeline? 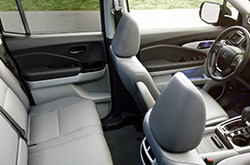 The new Honda Ridgeline now offers two additional USB ports for on-the-go technology. A new power sliding window along with a power moonroof are standard in the RTL and RTL-T trims. 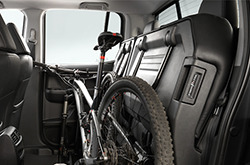 Unlike other pickup trucks of its size, the 2019 Ridgeline features a unit-body frame construction which helps to minimize outside noise, vibration, and rough driving. A stand-out feature which tailgaters will be thankful for is the in-bed trunk which is a valuable lockable space that can be used as an ice chest since it has a drain plug. Also, the in-bed audio and A/C outlet make entertaining outdoors a breeze. The tailgate is dual-action, meaning that it is conveniently opened down or to the side. Look for six different trims in the 2019 model starting with the RT and going all the way up to the Black Edition. The exciting Black Edition comes standard with all features of the RTL-E trim plus a sleek Crystal Black Pearl exterior paint, black leather interior, red ambient LED lighting, 18-inch black painted alloy wheels, and shiny black chrome accents. The Black Edition Apple CarPlay, Android Auto, HondaLink, Pandora capability, HD radio, SiriusXM radio and SMS text messaging function are some of the standard audio features in the RTL-T, E and Black Edition trims. While other audio and connectivity features like an auxiliary input jack, hands-free connectivity, and speed-sensitive volume control are standard in all trims. All trims in the 2019 model come with a V6 engine with 280 horsepower. A handy feature in all trims besides the RT is the remote engine start button located on the key fob which is almost a necessity in colder climate regions when one would like the cabin of their Ridgeline to be pleasant and warm before getting in. Hauling is a breeze in the AWD models with a 262 lb-ft of torque since it can tow up to 5,000 pounds w. The 2WD models get an estimated 26 MPG on highway driving. Its front-wheel drive gives you efficient packaging that improved interior and cargo spaces. All passive safety features like front and side curtain airbags are standard in all trims. Active safety features like the vehicle stability assist, brake assist, electronic brake distribution and brake assist are also standard across all six trims. Various mitigation systems are conventional in the top two trims and can be added to the other four trims. This Sensing suite includes adaptive cruise control, lane keeping assist system, road departure mitigation system and collision mitigation braking system. For off-roaders, the intelligent traction management system can come in handy since it adjusts to different road settings to maximize traction. 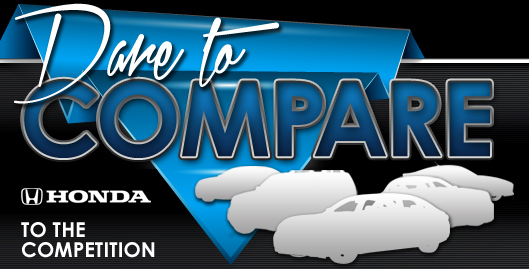 Vandergriff Honda invites you to come in to test drive the 2019 Honda Ridgeline. Is Topping Off Gas Bad for My Car?